Star Wars Battlefront is one of those games that you cast off early on a battlefield with virtually useless weapons and no equipment. However, it has to admit that Battlefront lets you equip with suitable blasters, although they are not as effective as you unlock most advanced weapons later. Stormtrooper with the E-11 Blaster Rifle. These weapons are fine at first, the damage per second is reasonable although the scope, rate of fire and overheating resistance weak. You should consider upgrading to the DLT-19 which costs you 550 credits or DH-17 also cost you 550 credits. Buy one that suits you best, knowing that the DLT-19 is a powerful machine gun designed to attack at long range and coverage shots that lack of power at close range and that the DH-17 is an effective short gun and medium range. Granada Impact - Can be unlocked at Rank 6 for 7,000 credits, no lifesaver in close combat. Scan Pulse - Can be unlocked at rank 13 for 1700 credits, always know where your opponents are. Jump Pack - Can be unlocked at rank 13 for 3100 credits, very effective to get you out of predicaments indoors. 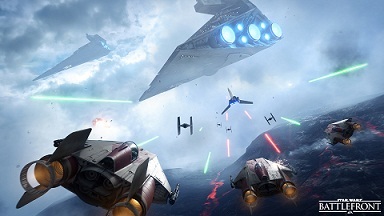 This is one of the keys to success in Star Wars Battlefront - using its environment, both visual and audible. Know that in Battlefront, everything that a player produces a noise. A headset greatly increases your vigilance and attention to the environment. Knowing where the enemy is located, without even seeing him, is a considerable advantage. Keeping a low profile is very important here. As normal you are not a hero, you're a soldier as vulnerable as others. Going on Rambo mode is absolutely worthless, since there will always be a camper to remind you that a well-placed shot is enough to get you back in your place. Here are other good stuff to know about some weapons and some recommendations. - The E-11 Blaster remains the most effective and most reliable weapon regardless of the game mode. - The EE-3 is a super blaster firing in bursts, very effective at long range. - The T-21B is a gun that shoots very slowly, but made huge damage. - The DL-44 Pistol, iconic weapon of Han Solo, is deadly in close combat.